You are currently browsing articles tagged Benjamin Morgan Palmer. The guest preacher in the pulpit of the First Presbyterian Church of Chattanooga, Tennessee, was closing out his prayer when the cannon shot hit outside the window of the church. Union forces of the Northern states were known to be advancing, but it was thought that Confederate forces were blocking their entrance to the city. They were wrong, as the cannon shot proved. But the Rev. Benjamin Morgan Palmer was not about to let anything hinder his prayer to the God of providence, But when he finally finished that long prayer and looked up, he found the pews empty with the congregation fleeing to safer places. We could describe Benjamin Palmer in countless ways during his lifetime of 84 years. He was a faithful pastor, powerful preacher, theological professor, a Presbyterian of the Presbyterians, and a symbol of the immutability of the great essentials of the Christian religion. Let’s take just three of these descriptions. 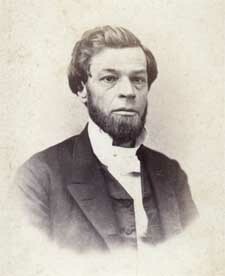 Palmer was the teaching elder at three Presbyterian churches during his pastoral ministry. It was at this last one — the First Presbyterian Church of New Orleans, Louisiana — that he would reach the zenith of his influence. The congregation increased in size under his ministry until it became the third largest Presbyterian church in the South. He feared no one or nothing. Once when a yellow fever epidemic hit the town, and most of the other pastors fled, he stayed on to minister in home and hospital to those stricken with the disease. In later years, Palmer almost single-handedly brought an end to the practice of lottery in Louisiana. Click here to read his famous sermon on that subject. Palmer’s preaching stirred many a soul. Here were the fruits seen of his mother’s home-school training. He could quote Biblical passages and Shakespeare with equal ease. In fact, it was his Thanksgiving message in 1860 on secession and slavery which stirred the southern states to rise up and defend their homes against the threat of Northern aggression. That one message caused him to become the pastor of the Confederacy. It convinced Louisiana to join the other seceding states. And when after four hard fought years ended in defeat, he became the high priest of the Lost Cause. 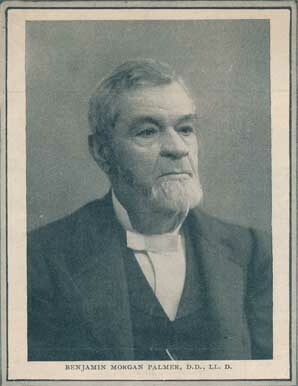 Named after his uncle, who was himself a Congregational pastor, Benjamin Morgan Palmer was born on January 25, 1818, in a family full of ministers, including his own father. In schools and congregations, in seminary as a student and professor, as the first moderator of the Presbyterian Church of the Confederate States of America, as the chaplain to the Army of the Tennessee (C.S.A. ), as the spiritual comforter of the defeated South, Palmer served God and his generation as a symbol of the immutability of the great essentials of the historic Christian faith. He possessed a life-long commitment to Reformed theology. Words to Live By: Can it be said of you that you are known by your unswerving commitment to the essentials of historic Christianity? If you can, give praise to God for it, and if not, resolve to have it be your testimony from this day forward.